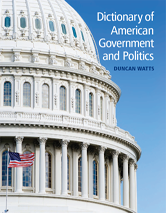 This Dictionary offers a fresh, up-to-date look at US government and politics, explaining and where necessary demystifying the key terms used in discussion of the political system. Major figures, events, ideas, movements and Supreme Court cases relevant to a study of the American political system are included with the aim of allowing readers to develop a deeper knowledge and understanding of the area. The Dictionary also raises key issues and areas of contention and academic debate. Coverage is comprehensive, with c.400 entries, each providing analysis of the subject. Terms are presented in an A-Z format with cross-referencing where appropriate.